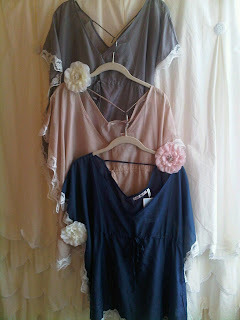 A new selection of feminine, sheer blouses from Love Spray has arrived at Muse Room Kailua! Soft hues of cream, mauve, and navy all come with a white lace trim. Slip one on for a pretty, comfy look at home, or over leggings or shorts to for wear outside of the budoir. Hour Glass Lilly is Back! Moké's... Now Open for Lunch!